Colorado Spruce is the familiar broad pyramid everyone knows. Very stiff, regular, horizontal branches hold 4-sided needles varying from dark green to electric blue. This favorite (but prickly) living Christmas tree can be containerized and used for many years. Once planted out, allow room for its 50ft (or more) by 20ft size. Most often used as a specimen, it also works in a mixed conifer planting where it adds a strong form. Adapting to many conditions, it grows best in reasonably fertile, well-drained soil with moderate water and sun. 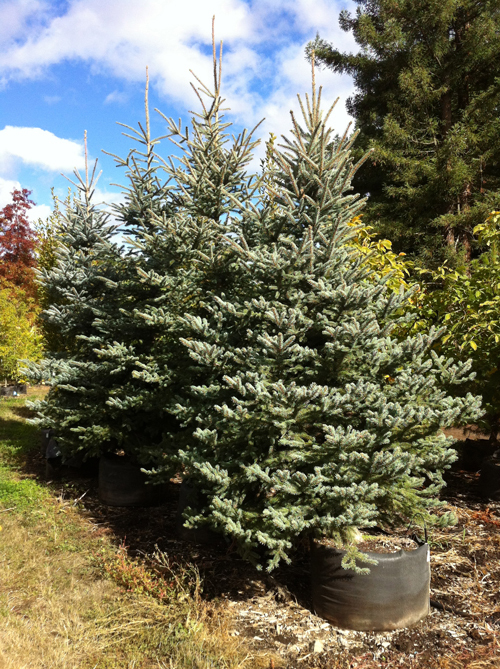 Conifer Size 1 gallon3 gallon5 gallon12 ft.